Kedaton Temple is one of the unique temples that made of Andesit stone. This temple built about the end of XIV century is unique temple with beautiful scenery around. 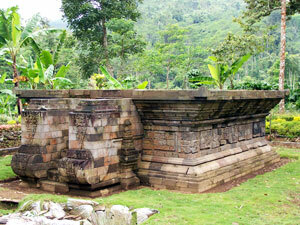 It is located in 60 km to south of Probolinggo at Argopuro valley. The summary of Garudeya story has carved on its relief. The location of this Hindu building is in Lawang Kedaton sub-village, Andungbiru village, Tiris district, Probolinggo regency. The temple sized 6 meters square and has year signed on its stair, 1292 saka (1370 A.D). Kedaton temple has 33 relief on the temple's feet. Beside Garudeya story, some relief are told about legend story, such as; Arjunawiwaha and Bhomakwya. The other relief story has not known yet. Garudeya story described in three relief. Two relief published by Bernet Kempers in 1959 in his famous book, Ancient Indonesian Art. One relief is the scene of Eagle open his mouth to eat residents; the other relief is the scene of Eagle say thank you to his mother. The small Kedaton temple seems has big attractive value of its relives. Bernet Kempers published the other two relives that described about legend of Bhomakawya. "A Very Emotional Scene", said Kempers to a relief that described Samba, Khresna's son, visit Princess Yajnavati before he fight with a Giant soldier. Beside Bernet Kempers, Balai Arkeologi Yogyakarta (Archeology Center In Yogyakarta) consider the important of Kedaton temple relives as the source about flora and fauna, and also the source about ancient Java fashion. Those are described on the relives and has documented in 1997.